Before booking a rental, please review our Boat Rental Policies by clicking here. Boats that will be available to rent will be posted online a few days prior to the weekend. We do not post the rentals at any particular day/time - it is when the inventory available is confirmed. Members may only register for two rentals at a time. Rental reservations will close at 12:00 (noon) the Friday prior to the weekend. Rentals must be cancelled no later than 12:00 (noon) the Friday prior to the date of the rental. If you neglect to show up for your reserved rental, you will be required to pay a $25 fine. Reminder that you must have your District of Columbia Boating Safety Certification card with you. Our fleet of six 19’ Flying Scots and ten FJs are available to DC Sail members who are certified to rent these boats. You may reserve a Flying Scot if you have passed DC Sail Learn To Sail course and/or a Check-out Sail. 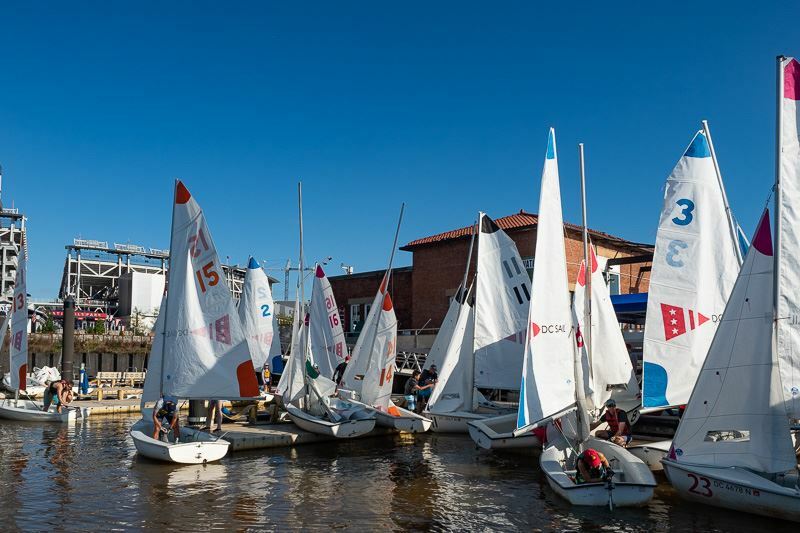 You may reserve an FJ if you have passed DC Sail Intro to FJ Course and/or a Check-out Sail. Early season FJ rentals (April and sometimes May and then again from October through cold weather months) require a wetsuit or drysuit if the combined water and air temperatures are less than 120 degrees due to risk of hypothermia. No fees for Boat Rentals for Super Members. You may reserve a Flying Scot if you have passed DC Sail Learn To Sail course or can present valid certification from another qualified sailing school. You may reserve an FJ if you have passed DC Sail Intro to FJ Course or have years of qualified FJ sailing experience. Wetsuit/Drysuit Policies: Notice April 2019: As the river temperature has risen above 60-degrees, there is no wet/dry suit required. Early season FJ rentals (April and sometimes May and then again in the fall,) require a wetsuit or drysuit if the combined water and air temperatures are less than 120 degrees, due to risk of hypothermia. No exceptions. Saturday & Sunday, 10:00 AM to 1:00 PM & afternoons, 2:00 PM to 5:00 PM. $50 per Flying Scot, $30 per FJ for Basic Members for a three-hour sail. Boat Rental fees are waived for Admiral, Instructor, Lifetime, and Super Members.